Kenny Lawler: More than Goff’s Buddy? 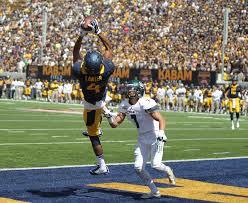 WR-Kenny Lawler, California 6′ 2″ 203 lbs. Cons: The wide out is not a very physical player; he rarely faced press coverage and cannot out jump or handle getting knocked around. Aggressive defensive backs tend to disrupt his more finesse based skill set and sometimes get in his head, forcing him into mental mistakes. Lawler is a long strider that needs time to build up speed which is evident with his disappointing 4.64 NFL Combine 40-yard dash time. He doesn’t improve his skill set with the ball in his hands, which makes him a bit average after the catch. Simply put, Lawler is more of a possession receiver which may only translate into a dynasty WR3 or WR4. Pros: The former Cal Bear runs crisp routes, shields the ball from defenders, and can catch the pigskin at its highest point with his soft 10.5″ hands. Lawler does a good job tracking the ball in the air, and is willing to contort himself to make difficult receptions by fully extending his body. The wide out thrives in the red zone and can come down with spectacular grabs (good catch radius). He lines up both on the outside and in the slot. While his timed speed is nothing to get excited about, the receiver has quick feet and can make defenders miss in the open field. Lawler is great in small areas and good vision to read hi blockers, which makes him quite effective running the bubble screens. While he isn’t a lightning fast deep threat, the former Bear can make nice bucket catches 40 or 50 yards downfield while straddling the sideline. Overall thoughts: Lawler isn’t going to knock you over with his skill set. He isn’t overly physical and is more quick than fast. The wide out is more of a technical player who can come down with a few splash plays from time to time. This is the type of player you grab at the end of the second or third round of your rookie drafts. If the receiver goes to a higher octane offense, you might get some initial production; otherwise it might take time for him to make an impact. Don;t tally dismiss him as he could follow a similar path that fellow former Cal Bear Marvin Jones took. Please follow me on Twitter @AndrewMiley and/or the site @Dynasty_Blitz. « Braxton Miller: Substance or Hype?